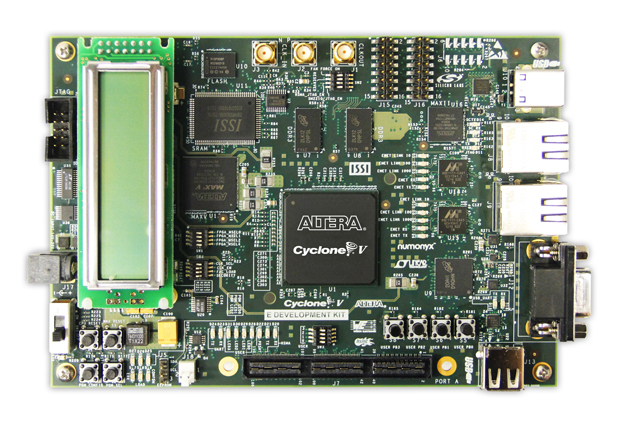 The Cyclone® V E FPGA Development Kit offers a comprehensive general purpose development platform for many markets and applications, including Industrial Networking , Military , and Medical applications. The kit features an Intel® Cyclone V device and a multitude of on-board resources including multiple banks of DDR3 and LPDDR2 memory, LCD character display, LEDs, user switches, USB, and RJ-45 connectors. The Cyclone V E FPGA Development Kit gives industrial equipment designers greater flexibility in implementing real-time Ethernet communications with Industrial Ethernet intellectual property (IP) cores.